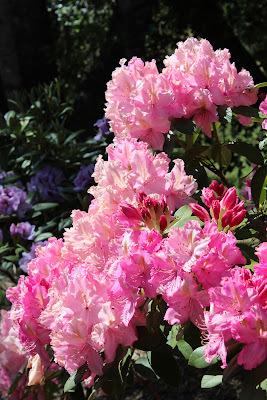 Take time to smell the "flowers on Friday"
Taking time to stop, look at, and smell flowers is something I love to do...and right now, every time I go in the bathroom, the sight of this wonderful rhododendron plant through the window just stops me in my tracks. It is so beautiful and full of flowers! It just catches your eye and you have to stop and be amazed! We have a few bushes, all different colors, but this one below is at its peak right now. 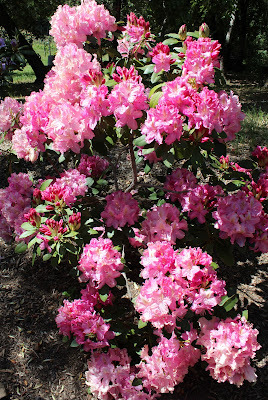 The others are lovely shades of pinks, purples and reds, and across from the rhododendrons are azaleas - also full of blooms this time of year! What a stunning blaze of color. So I'm going to start a 'flowers on Friday' blog post, making sure that some time of my week is spent actually wandering around the garden and enjoying all that nature has to offer. It started last week with the peonies, and this week rhododendrons.....what will be up next week? I hope you have found the time to stop and admire nature this week...if not, how about today? It will lift your spirits and provide a little snippet of relaxation. A wonderful moment in your day.